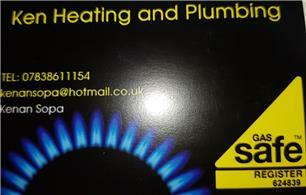 Ken Heating and Plumbing - Central Heating Engineer based in London, Greater London. My name is Kenan, I am a Gas Safe Registered Engineer based in Swiss Cottage NW3 LONDON, and cover areas in North London, North West London, West London and many more, please ask. Providing a reliable Boiler and Heating services, I will quickly restore your hot water and central heating, mending your Gas Boiler and Gas leaks resolving your plumbing issues.